WASHINGTON (CNN) -- The White House said Wednesday that it was "puzzled" by a former spokesman's memoir in which he accuses the Bush administration of being mired in propaganda and political spin and at times playing loose with the truth. 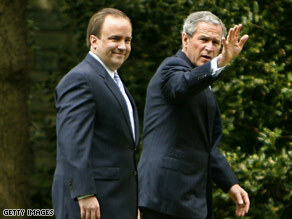 Former White House spokesman Scott McClellan blasts President Bush and advisers in a new book. In excerpts from a 341-page book to be released Monday, Scott McClellan writes on the war in Iraq that Bush "and his advisers confused the propaganda campaign with the high level of candor and honesty so fundamentally needed to build and then sustain public support during a time of war. "Scott, we now know, is disgruntled about his experience at the White House," Perino said. "For those of us who fully supported him, before, during and after he was press secretary, we are puzzled. It is sad. This is not the Scott we knew." McClellan's former White House colleagues had harsher reactions to his book. "Scott McClellan was not the press secretary. He was the deputy press secretary who dealt with domestic issues," said Dan Bartlett, a former White House counselor. "So, he would not have even been really have access to the types of meetings and deliberations that the president participated in." A Clinton White House insider said McClellan's account has credibility because his long proximity to Bush gave him a window on how the war was prosecuted, and he may now be having pangs of conscience. "I think he has come to the conclusion -- as two-thirds of the American people have -- that it was a bad mistake of judgment on behalf of the president," said John Podesta, a former chief of staff for President Clinton. Besides his criticism of how the administration handled the run-up to the Iraq war, McClellan also sharply criticizes the administration on its handling of Hurricane Katrina and its aftermath. "One of the worst disasters in our nation's history became one of the biggest disasters in Bush's presidency," he wrote. "Katrina and the botched federal response to it would largely come to define Bush's second term." Early in the book, which CNN obtained late Tuesday, McClellan wrote that he believes he told untruths on Bush's behalf in the case of CIA agent Valerie Plame, whose identity was leaked to the media. Rove and fellow White House advisers Elliot Abrams and Lewis "Scooter" Libby were accused of leaking the name of Plame, whose husband, former U.S. ambassador Joseph Wilson, had gone public with charges the Bush administration had "twisted" facts to justify the war in Iraq. McClellan wrote he didn't realize what he said was untrue until reporters began digging up details of the case almost two years later. A former spokesman for Bush when he was governor of Texas, McClellan was named White House press secretary in 2003, replacing Fleischer. McClellan had previously been a deputy press secretary and was the traveling spokesman for the Bush campaign during the 2000 election. He announced he was resigning in April 2006 at a news conference with Bush.